The Wayward Knitter: Sweaters and Zoo Plans! My Easy A sweater is progressing nicely. I finished the bottom ribbing and am into a nice long stretch of garter stitch. Tonight some people from the library are getting together for drinks with a coworker who's leaving in a few days, so I'll get a couple of hours of bar knitting in. Considering that I first conceived the plan for this sweater in a bar, it feels appropriate. I'm also working on the sleeves for my Stripey Bosom- I know I haven't really shared that one with you yet, but I really love it. I spent three hours weaving in all the ends from the body, and I'm four stripes into the first sleeve. 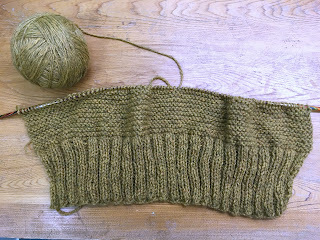 I haven't decided for sure yet how long I want the sleeves to be, but it's an aran-weight sweater on US9 needles, so I know they'll be done quickly! This weekend some friends and I are going to the zoo! Our zoo has some koalas through Labor Day, and we've been wanting to go see them since they arrived. I absolutely love koalas, ever since I was a kid- they're sleepy, hungry, cuddly, grouchy little marsupials, what's not to love?